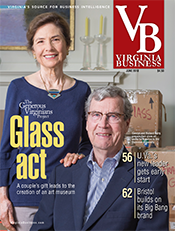 Photo by Sarah Hauser, courtesy Virginia Tourism Corp.
Tourism, once mostly grounded by the recession, is taking off again in Virginia and across the country. 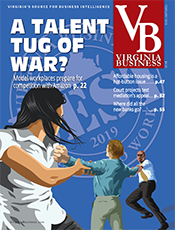 With new hotels in the pipeline and the state’s rising profile as a destination for culinary experiences that include visits to wineries and breweries, Virginia is positioning itself for a strong 2015. 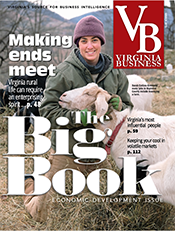 “Culinary tourism has become huge,” says Caroline Logan, director of corporate communications for the Virginia Tourism Corp.
With food usually comes lodging, and that’s trending in a positive direction as well. “Viewed from the 50,000-foot level, the lodging industry is in a really good place,” says Bobby Bowers, senior vice president of operations for Smith Travel Research, which tracks hotel room supply and demand around the world. As of the end of October, the revenue per available room, a combined measurement of occupancy and room prices, was up 8.4 percent nationwide to $70.70 a night compared with 2013, representing what is projected to be the fifth consecutive year of growth. “Most people expect 2015 to be a smidgen lower, but I am not convinced that it will be lower at all,” Bowers says. In Virginia, the news has been good, too, though more earthbound. 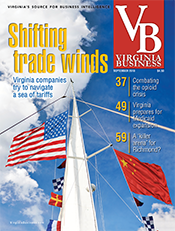 The lingering effect of sequestration on Northern Virginia and Hampton Roads has suppressed government and corporate travel, which only now are in recovery. The result, as of October, has been an increase in revenue per available room of 6.4 percent to $58.72 compared with 2013 — numbers that were good enough to make tourism one of the few expansion areas in the commonwealth’s economy. While figures for 2014 aren’t in yet, the state saw $21.5 billion in revenue from tourists in 2013, a 14 percent increase from 2012. Even though demand for lodging was on the increase last year, only modest numbers of new rooms came on line during 2014. 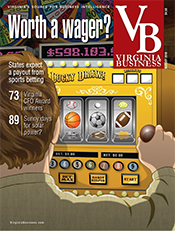 As of mid-November, Virginia had expanded its hotel room numbers by just 0.1 percent in 2014, while the national rate was 0.8 percent. 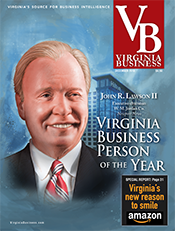 Slow growth is expected to continue in 2015, Bowers says, with about 2,170 new rooms in the pipeline for the commonwealth for a growth rate of about 1.5 percent (see story on Page 57). Most of the visitors who occupy those rooms — 58 percent in 2013, the last year for which figures were available — come to the commonwealth by car to visit family and friends, according to the research firm TNS Travels. These visitors will continue to be the mainstay of the Virginia tourism and hospitality business. Yet two major sporting events (see story on Page 57) and several travel trends, including culinary tourism, should help the state’s tourism industry gain altitude in 2015. 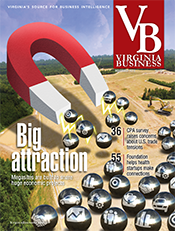 One factor in Virginia’s favor is a surging millennial market. Logan says many younger tourists are attracted not only by the state’s varied opportunities for outdoor recreation, but by the chance to have authentic local experiences at reasonable rates. That quest dovetails nicely with another trend: the exponential expansion of wineries, breweries and locally sourced restaurants. 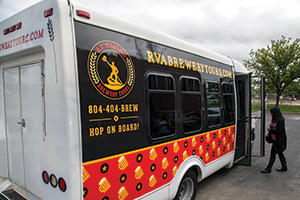 Virginia now has more than 250 wineries and counting, and so many craft breweries (more than 60) that the state tourism website offers itineraries for beer tours. 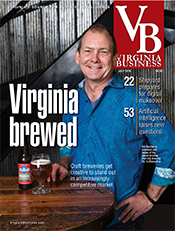 Stone Brewing Co., the 10th largest craft brewery in the country, is getting into the act, promising to invest $74 million in a brewery that will open in Richmond next year. Restaurants are paralleling that development by drawing diners with their locavore credentials. 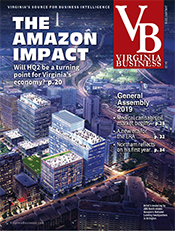 In a coup for the state, Esquire magazine recently announced that Virginia was not just about ham anymore in naming it the Food Region of 2014. Increasingly, hotels and bed-and-breakfasts are partnering with chefs for cross-over events and promotions, says Logan, using last November’s Wine & Brine festivities along the Eastern Shore as an example. Under development in that region now is an oyster trail that will celebrate the waterman culture of the Chesapeake Bay. Logan says the self-guided route should be ready in the next 12 to 18 months. 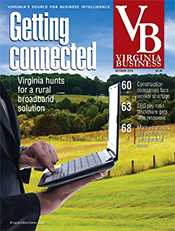 The southwestern section of Virginia likewise is trending. The popular Crooked Road, a 300-mile route through the region’s folk and country music heritage, now is supplemented by the Birthplace of Country Music Museum, which opened in August in Bristol. The nonprofit museum’s executive director, Leah Ross, expects it to average 90,000 visitors a year with revenues projected at $2.5 million by the museum’s second year of operations. The three-day Bristol Rhythm & Roots Reunion festival has become another big draw for Bristol. In its first year, the three-day festival drew 7,500 people; last year, on its 15th anniversary, 60,000 people showed up to hear more than 1,000 artists. New outdoor attractions in the region are sprouting up too, most notably the Spearhead Trails project, an ambitious network of 500 miles of ATV and equestrian trails near Saint Paul. The 70-mile Mountain View trail there already is open, and completion of the rest of the trails is promised by next year. Near Pocahontas in Tazewell County, Spearhead will add 20 miles of ATV trails this year to augment the 30-mile Pocahontas trail already in operation. 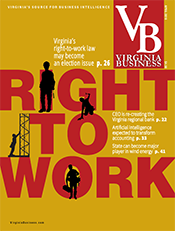 Another significant development for tourism in the region includes the return of the Virginia Museum of Transportation’s Norfolk and Western Class J 611 steam engine to Roanoke. The engine, built in that city, has been undergoing a $3.5 million restoration in North Carolina, but it will return home under its own steam in April, says the museum’s executive director, Beverly T. Fitzpatrick Jr. The engine, pulling eight to 15 cars, then will make four weekend excursions a year on Norfolk Southern tracks, west toward Radford and east to Lynchburg at dates yet to be determined. Once in operation, Fitzpatrick says, the Class J 611 will offer the only steam engine excursion in the commonwealth.